A new Portal game has been leaked, and it’s a bridge-building game. Yep. Rather than making Portal 3, Valve have farmed out one of their flagship IPs. Portal is on our list of the best PC games, despite its lack of bridge-building. Rumours about a new Portal ‘thing’ being announced at The Game Awards began this morning, although very little information was offered about what that could be, and nor was the source offered. So although it was reasonably exciting as a possibility, I personally didn’t pay it much attention. Earlier this afternoon, however, that new project was revealed to be very real, although far from what anyone might have expected. Bridge Constructor: Portal is a bridge-building game that takes place in Aperture Science’s new vehicle testing labs. 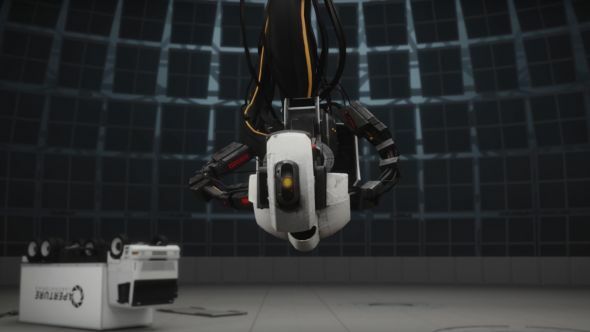 According to an unlisted YouTube video which was leaked earlier, as well as the titular portals, turrets and even GLaDOS will feature in the game, which involves solving bridge building puzzles using portals. The description then goes on to say that Bridge Constructor Portal will be available on PC and mobile on December 20, and console versions will follow in early 2018. You can check out the video above, for now, but there’s every likelihood it might be taken down.